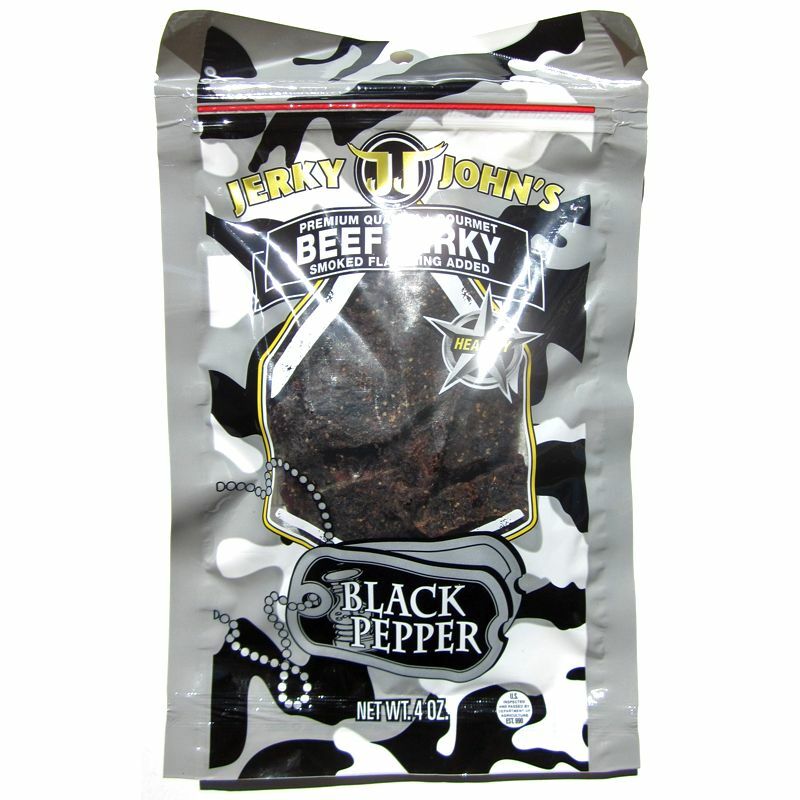 Last in the series on Jerky John's is this Black Pepper variety. See my previous reviews of their American Original, Cayenne Hot, and Pacific Teriyaki varieties. Beef top round, Yoshida's Teriyaki Sauce, Kikkoman's Low Sodium Soy Sauce, Lea & Perrins Worcestershire Sauce, brown sugar, Tabasco Sauce, cayenne pepper, granulated garlic, granulated onion, liquid smoke, black pepper, prague powder (sodium nitrite). The first thing I taste from the surface of these pieces is a significant sweet mixed with a worcestershire flavor. Some of the teriyaki is noticeable too. The black pepper is lightly noticeable. The chewing flavor starts with some tanginess, followed by some natural meat flavors, and a more defined worcestershire flavor. The saltiness picks up a bit while the black pepper comes in a little stronger. The garlic and onion is also noticeable. For being named "Black Pepper", this does have a clearly recognizable black pepper flavor in the back of my mouth, as well as plenty of cracked pepper corns visible on these pieces. The flavor builds up strength over several bites and creates a strong aftertaste that carries over piece after piece. Overall, the flavor tastes quite comparable to the company's Pacific Teriyaki variety, but with more black pepper, and it seems like more worcestershire sauce as well, or at least it's a little more noticeable. And I think that's largely the ingredient that dominates this jerky, the worcestershire sauce, but it's just more sweetened. There's a fair amount of tanginess in there too, which seems to liven up the chewing. The black pepper largely sits in the back of my mouth creating that strong aftertaste. The natural meat flavors are noticeable but don't seem to be the main focus of this jerky. It's remains a light flavor behind the sweetened worcestershire marinade, but still adds enough to create that marinated, seasoned, steak-like character. Some of the pieces have streaks of fat that add a fatty flavor. There's also a noticeable garlic and onion flavor. The level of saltiness in this feels to be at a medium level, despite the nutrition facts label showing a very low sodium content. Overall, what you're going to notice in this is a sweetened-up worcestershire sauce flavor, with touches of teriyaki and soy sauce, along with a significant black pepper aftertaste. You'll get a noticeable natural meat flavor, along with a recognizable garlic and onion flavor. This is a dry jerky having a sticky, semi-moist surface feel. These pieces have a fair amount of flexibilty, but will still crack open when bent far enough. Tearing pieces apart with my fingers seems fairly easy, while chewing is chewy, though not as labored as the company's other flavors I reviewed. The chewing texture starts out feeling semi-moist, but chewy. There's a fair amount of initial chewing resistance, and chews down to a soft mass with some effort, but not too bad. At that point, it takes on a meaty, steak-like feel, but still a tad chewy. 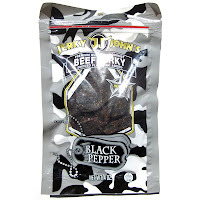 Jerky John's sells this Black Pepper variety through Amazon.com at a price of $25.96 for four 4oz packages. Shipping costs of $4.99 brings the total to $30.95. That works out to a price of $1.93 per ounce. 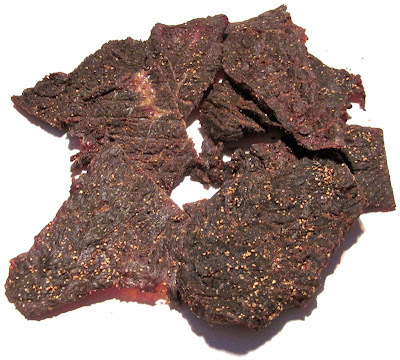 For general jerky snacking purposes, at the $1.93 per ounce price, this offers a good value. I'm getting a lot of snackability for its great overall flavor, fairly easy eating, and steak-like chewing texture. Compared to the major brands of jerky found in grocery stores, this is priced about the same, though clearly better in flavor and chewing texture. As a Black Pepper beef jerky, at the same $1.93 per ounce price, it's also decent value. I'm getting a lot of black pepper flavor in this, about the same as what I'd get from the major brands, and about at the same price. 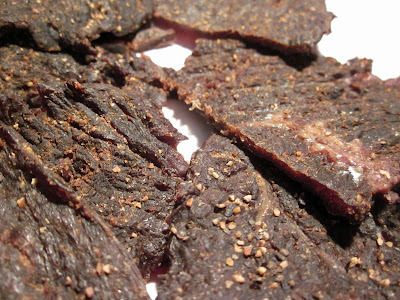 This Black Pepper variety from Jerky John's offers up plenty of black pepper flavor, but delivers most of its taste through a sweetened-up worcestershire sauce, with touches of teriyaki and soy sauce, giving it a lightly tangy chewing. It dishes out enough natural meat flavors to give me a sense of eating a marinated, seasoned steak, and throws in some garlic and onion flavors too. This jerky is largely comparable to the company's other varieties, namely their Pacific Teriyaki, but it seems to differ slightly in that this has more of a worcestershire flavor, but of course with plenty of black pepper flavor. And that black pepper adds an extra dimension that the Pacific Teriyaki didn't have, a sharp bite to contrast the sweet and saucy flavors. And that black pepper does a better job than the cayenne pepper in the company's Cayenne Hot variety. I also found this Black Pepper variety to be more soft and tender than the other varieties. I would assume that's just a variance in the batches and the meat texture, and not something specific to this Black Pepper. But nonetheless, this particular review sample was easier to chew and that created more snackability for me. It could still be that Jerky John's tends to be on the tougher side in general, and that this particular package happened to be the exception. Who knows. I also think being more soft and tender tends to bring out the flavors more, or vice-versa, where having more marinade in the meat makes it more tender. But that doesn't tell the whole story with this Black Pepper variety. The black pepper is doing a lot to provide contrast against the sweet and sauce, and the natural meat flavors. My recommended beer pairing for this, go with a simple brown ale. The heavier, roasted malt flavor should go well with this marinated, seasoned, steak flavor. Try the Big Sky Moose Drool, or the Lost Coast Downtown Brown. I'm not knocking this jerky let's make that clear but the sodium levels of this jerky is just not low by far! These are the sodium / nutritional values from the ingredients listed in this jerky. And again I'm not knocking this jerky because I haven't tried it but the sodium level of this jerky is not the lowest out there. 150mg per 1oz serving is pretty low compared to the 200+ reviews I've done. Joe's Beef Jerky "Regular" is also pretty low. I just tried this jerky at the Cocoa Beach Air Show and WOW!! The taste is amazing and the tenderness to die for. This guy surely has a passion for quality beef jerky that's next to none. Try it for yourself. I was disappointed with this Beef Jerky. I consider myself a beef jerky lover and am in search for the "perfect jerky." I do agree that the texture/consistency is great. The pieces are very tender and enjoyable. On the taste side. I have tasted nothing but bland strips with the occasional sweet/tangy as described in this review. The meat has very little taste and more times than not is over-powered with spices. My strips look nothing like the pictures in the review. With 4 bags I am hoping to salvage something from my money spent. I would rate this somewhere between 3-4 stars.